Well the press loved this car, just the price tag put people off due to the ression that hit the U.K at the time. Here is some reviews to start off with. There is a possibility some things here could be wrong as reliable info is hard to find! But this is how I see it. All Minker's are MK2 XR4x4 Sierra based. The Minker name comes from the owner of TT, Geoff Kershaw’s surname & his wife’s maiden name. (Min + Ker). Anything they considered special got the name Minker, hence there is or was even a Minker surf board!!!! 3 K1 Minker's & 6 323's where built by TT. All the Minkers where built at Northampton or TT south not at the dealers. Some cars where built after 1995 but these where not built by TT, they where either copies or made up of Minker parts after that arm of TT that did the conversions stopped trading. These later cars where not true Minkers as they lacked many of the STD Minker spec parts. It's believed TT built 9 Minker spec cars. 323's are just mechanical with interior as optional etc. In 1990 a K1 was £41,900 new. A 323 was £34,500 new in 1991. In 1987/8 TT came up with the Minker idea & had a red development car on the road. 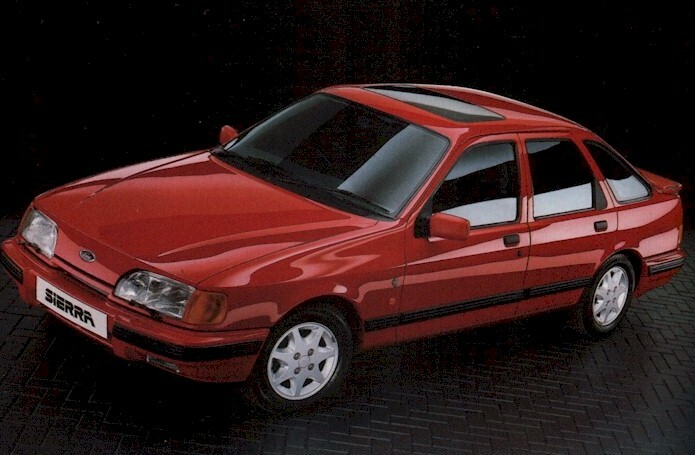 It used the new Sierra 2.9 XR4x4 MK2 as a base that had just been released. This was at the 1988 Motor show. The red one was for the body kit development mainly & was fitted with a single turbo TT250 2.8 engine. So it looks like a Minker but does not have the go of one! The TOP GEAR Motor Fair show report was started off with Noel Edmunds driving the red car that was fitted with the boring 2.8 TT250 engine, as it was a prototype. Interestingly it had the number plate from the TT Dimma Peugeot on it! Then in 1990 TT built the Blue K1 (press Car) that dulux now owns on here. This was the car that the press raved about at the time, also TT had now got the engine to make 320 bhp & 345 lbs at lower revs than before. Later in 1990 the white K1 was built for a customer. In 1991 TT decided that maybe the public was not ready for the K1, so they built a "Minker 323" press car which was a K1 but without the bodywork & interior mods. It looked nothing special but was infact one of the fastest road cars you could buy at the time. Power rose to 323bhp & torque went to an amazing 348lbs at 2800rpm 1000rpm lower than the first K1's. TT Now had a brochure for both cars. That's about it, TT did not build anymore K1's but did go on to build some 323's. Sierra's then went out of production & that was that. TT was just in the middle of completing a TT set-up for the 24V Cossie engine in 1997 when that side of the company ceased trading. Dam shame that as Geoff's sprint car which has the development engine in, is still considered the best 24V around. Infact it is a championship winning car & holds a number of track records. Alan bought what he could from TT & went on to build more Minker based cars in various specs. However none where full on conversions. MNK 01 Was the prototype test engine/car that eventually made 400BHP & 460 lbs. This is the actual car Geoff crashed on the track but he used the engine until 96ish, then Alan fitted the engine to his own spec car. Phatphil on here looks after it for his mate who bought it from Alan. Still alive & well. MNK 02 Is Dulux's Blue K1 car. Alive & well. MNK 03 is the white K1. Alive & well. MNK 04 is the black 323 press car & is down London way. Alive & well. MNK 05 is a black 323 with an RS kit fitted. Alive & well. MNK 07 is the white 323 from the Oldham area. Alive & well. MNK 09 is my black 323. Alive & well. There is/was said to be a 1989 (first registered) red 323 car. This car has not been taxed or sorned since 2007 so I assume it's dead! This car is/was either MNK 06 or 08 & must have not been Minkered as new as it's the only way it would fit into the time line! However it should be noted that I am told there was some debate if this car was a TT built Minker or a clone! I never saw it so can't comment but I assume it was the real deal. There was a prototype red K1 car but it only had a 2.8 single turbo engine so is not included above. This is the car that Noel Edmunds drove on T.V. I was told this car was in bits in a guy’s garage. Talk of a goldie coloured one but I think it is only talk. Alan went on to build some high spec cars with the parts he bought from TT. But as I said before these didn't have all the STD Minker mods so are not actually Minker spec cars. I know of 4 of them. Gengis's dark grey car was one but is something completely different now! Another was a blue XR4x4 that got smashed up. Lastly a very STD looking estate that got broken for parts. Also MNK 001 as included above, Alan built the car but the engine was from the first Minker. There are as many if not more TT based cars that are running Minker power but where not built by TT as a Minker, so do not include the package of mods. The Minker package was the result of years of testing, so was far more than just an engine! As Dave said "TT was just in the middle of completing a TT set-up for the 24V Cossie in 1997 when that side of the company ceased trading"
So the 24v Minker never became a reality, but the development car did and as far as we know its still running, and running well!! The car belongs to the owner of TT Geoff, its his track car & is called either the K2 or Minker depending who you speak to. Modded oil ways, dual crank feed, piston sprays, girdle, AE pistons with ceramic tops/slippey skirts, 7.25:1 comp. Max 7000rpm with 7500rpm over rev capability. STD crank & rods. Modded heads/ports with enlarged exhaust ways & 34mm ex. vavles. Custom inlet, 12 injector's, inlet trumpets, 6 hitachi ign. coils. Garret T28VNT's turbines with T3 compressors reworked by TT with custom casting. About 500BHP per tonne, car weighs about 1000kg. 1 bar is about 530bhp, 1.6 bar is just over 600bhp/500lbs & it's sister engine did 750bhp on an engine dyno but ran into reliability problems. Also uses 3.14:1 C & P in the diffs to! O.k so ya impressed and want to see it,,,right? I know it seems alot Mike but it's a very trick engine, you got the normal injector's which are uprated then some that squirt into the trumpets depending on load, the heads are ported & some fancy valve work. I believe it, I don't think anyone is going to get near it for a while yet as even now it's still very trick & would be expensive to match. I think mine will be always 50 - 100bhp behind it at the same boost. When I finish it. We know that a BOA with proper management, inlet & some cam work can make 250 - 260 bhp. So add to that heavily worked on heads then forget about that because it's lower compression then take the upper figure 260bhp & double it, hmmm it is about right. 520 bhp. It is just possible but shows the engine must be well done to get his results. They must have outside help I think, no one can get it so right from the the very start with no info to go on either. Here is the spec sheet that Geoff sent me once, pretty much as posted before, but maybe of some interest. ENGINE TYPE V6 turbocharged - 2933cc, based on the Ford/Cosworth FBA. POWER OUTPUT - 600 + BHP. Max torque - 500 + lbf-ft @ 4,000 rev/min. CYLINDER BLOCK Cast iron, water-cooled. Twin stiffener rails to support main bearing caps. CRANKSHAFT Cast iron, ¾ - counterweighted and dynamically balanced. Steel alternative. PISTONS Solid forged aluminium alloy pistons with dished crown. Oil-cooled by fixed sprays. CYLINDER HEADS Cosworth heads with exhaust ports CNC machined and fitted with larger exhaust valve seat inserts. VALVES Standard inlet valves. Exhaust valves 2-piece stellite faced 34.0 diameter. Hydraulic adjustment. OIL SYSTEM Conventional wet sump oil system with a secondary off-take via a 2 bar priority valve for oil cooling jet feeds. FLYWHEEL Steel flywheel with separate pressed steel ring gear to suit application. Hub keyed to crankshaft with 6 radial keys. INDUCTION SYSTEM Low volume plenum with folded taper inlet stubs. Twin butterfly progressive throttle. EXHAUST MANIFOLDS Cast ni-resist manifolds of log type. Loose turbine flanges for installation flexibility. TURBOCHARGERS Twin turbochargers based on Garrett T28 VNT (Variable Nozzle Turbine) with T3 compressor. Variable nozzle control from the ECU via solenoid bleed valves. Boost pressure control via integral wastegates controlled from the ECU via solenoid bleed valves. FUEL INJECTION 12 injectors in high / low mounting configuration. Low injectors at cylinder head face, high injectors at the inlet bell mouths. Injectors sequentially operated and phased from low to high depending upon engine load. IGNITION Direct fire coils mounted over the spark plugs, running wasted spark. ENGINE MANAGEMENT Pectel T6 Management running with 3.0 bar map sensor incorporating data logging, hot shift, traction control, and launch control. Saw Geoff Kershaw with his Sierra earlier this year at a couple of sprints. Car still looks pretty similar to the pictures, but has a large cut out under the rear end forming a venturi to exhaust air from the rear mounted radiator. Blew an Mt75 gearbox at one meeting, Geoff said that was not the first time! Beautifully engineered competition car with lots of interesting detail modifications. How are the oil sprays done..? His are mounted on the girdle & can be shut off. Yeah he has broken alot of MT75's. He was gonna fit a Skyline box but after looking at how the transfer works he is worried it will affect the cars handling. Spent 3K on a uprated box for it that should never break. Not sure if he has fitted yet but he has bought it. It would be hard to copy TT's girdle as it is nothing like any other on here. It is shaped round the rotating assembly. For this reason the oil sprays can be mounted on it. Look at how they add oil sprays to V8's etc & copy that. That is what I have done, they are fed off the main bearings & you need the uprated oil pump. Now I know how I'm going to mount them. Dave, how do they make a switchable oil spray? I've a chevy project in mind and would like the oil sprays to be boost related. I've not really thought about it yet but maybe a selonoid valve would do the job. Mind you that could suddenly drop pressure to the mains/rods under load so maybe it needs to be an active 'leak' all the time and keep it simple instead that's the way to do it! Would an oil accumilator help? ... maybe it needs to be an active 'leak' all the time and keep it simple instead that's the way to do it! All oilpumps run in "active leak" mode as soon as the oilpressure bypass valve opens. Without it the oilpressure would hit the roof. valve will compensate for drop in oilpressure immediatly. Thanks Svein, something for me to think about. What about the switching arrangement, any thoughts on that? I could forget switching and just leave squirters operational all of the time. Best way would be to have the cooling sprays operate on a pressure switch, if the oil pressure drops below a certain pressure the sprays shut off saving the engine from oil starvation. full flow, + a safety margin, only a major fault can make the pressure drop. Like a bearing failure, pump failure or loss of oil. Another thing is that the oilpressure vary alot within the engine. The further away from the pump, the less pressure. Where to measure the pressure? A pressure switch may save the bearings, but most likely you loose piston cooling when you need it the most. You may just as well connect a pressure switch as a kill switch. If the oilpressure drops for any reson the best way to save the engine is to shut it down. A solenoid hydraulic valve operated by a pressure switch can be used to switch on/off the oilspray. A 12V DC solenoid valve rated for +100C oil may be a bit difficult to find, tho. Ask in a hydraulics shop. The oilpressure bypass valve will compensate for drop in oilpressure immediatly. The bypass valve on the pump is to relieve EXCESS oil pressure - it won't prevent a drop. Run the sprays off an accumilator so you have 2 sources of oil pressure - the pump for the normal duties and the accumilator for fancypants sprays. The bypass valve is bleeding excess oil as soon as set pressure is reaced. A standard oilpump may have an overcapasity as much as 100% to make up for future tear and wear pluss safety margin. Normally, full oilpressure is reaced at +1500 rpm. From this rpm and up the pump is pumping more than the engine can flow. This excess oil is bled of in the bypass valve. to pressure fluctuations instantaniously. As long as the pump has enough capasity there is no need for external aids. An accumulator is just an excuse to not fit a bigger oilpump or go drysump. The accumulator fill up when the engine is running at full oilpressure and release the oil when/if the pressure drops. It can only supply a limited quantity of oil for a short while. Hopefully it may be enough to save the engine. It's not possible to separate the accumulator from the main lubricating system as the accumulator is charged from the oilpump. Or do you suggest to run a separate oilpump for the accumulator and oilsprays? Also, the oil level in the sump will vary quite a lot depending on which state of charge the accumulator is in. In my opinion the accumulator is a band aid, not a cure. Mike I have not seen his set-up all I know is what he has told me. It does run off a pressure switch so they only squirt over a certain oil pressure. i.e high revs. An accumilator may work for 30 secs but what happens if your at idle for long periods or low revs. The accumilator won't work then as it will run out of stored oil. I think the higher flow pump may be man enough but needs testing. Orginally I was gonna use two oil pumps & an accumilator but I will re-think this & test the HV pump. It is how Cortiworth IV has explained but the STD pump is already at almost max flow on a STD engine. Thanks for the replies. This is an ls7 engine with an internal oil & dry sump pump. The later version (LS9) does run squirters but I've not checked to see if it shares the same oil pump. I'm hoping it does though as this would seem the easiest route to take and the safest to. Hopefully it may be enough to save the engine. It's not possible to separate the accumulator from the main lubricating system as the accumulator is charged from the oilpump. Or do you suggest to run a separate oilpump for the accumulator and oilsprays? Also, the oil level in the sump will vary quite a lot depending on which state of charge the accumulator is in. In my opinion the accumulator is a band aid, not a cure. Its meant for preventing momentary pressure loss caused by the pickup becoming uncovered, like during hard cornering, braking and accelerating so my 2qt should be fine. They also alow yu to pre oil the engine, by releasing the accumilated oil before startup, when 60-70% of engine wear occurs. Another benefit for me was the total oil capacity increase, which more than compensates for having a modified (smaller capacity) sump. I didn't get it to avoid anything, I have a highflow pump as well, mainly as I have an oilcooler too. What I was suggesting was running the sprays off the accumilator. Edit - ^Thinking about it, I agree this won't work for oil sprays. In that case, yeah, run a seperate pump for the sprays maybe? There must be a suitable pump out there - then controlling it would be easy. Just a thought - how about running a separate oil pump, like an external dry sump pump, to run the oil sprays? this may sound like a daft Q, but did the minker come with LHD...? Hmmm... Well, I'm sure one could be converted.! They would have had no problems building one if ordered. F80 is a Sierra LHD TT225 kit so they already had the basic parts to do it. Cheers Toby will have to look out for a copy.